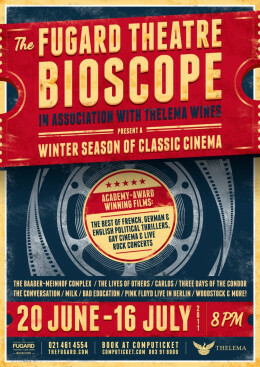 The new Fugard Theatre Bioscope hosted a month-long Winter Classic Film Festival from 20 June to 16 July 2011. This followed a week of classic films based on the plays of Athol Fugard, from 7 – 11 June, in honour of his Tony Lifetime Achievement Award which he received in New York on 12 June 2011. The Winter Classic Film Festival was proudly presented in association with Thelema Mountain Vineyards. The four week Fugard Theatre Bioscope Winter Classic Film Festival had four different themes. The film screenings started at 20h00 every night. Hot soup, fresh garlic bread, delicious Thelema Wines was on on offer and a warm atmosphere received patrons at the Fugard Theatre from 19h00 each night. The theatre had recently been fitted with new cinema-style seats, high definition cinema quality projection and surround sound systems which made the Winter Classic Film Festival a unique cinematic experience inside one of the most beautiful theatres in the country. The Classic Film Festival was programmed by Fugard Theatre founding producer Eric Abraham who also produced the Academy Award-winning film KOLYA.